I love Amla (fruit) and eat at least one daily. We have Amla trees in our farm and whenever my parents visit us, they bring a small sack full of Amlas. I often prepare Amla Juice. Whenever it is not possible to prepare Amla juice, I simply cut and eat it. As it is available in plentiful, my mom used to prepare few recipes using it . This Amla Rice is one among them. 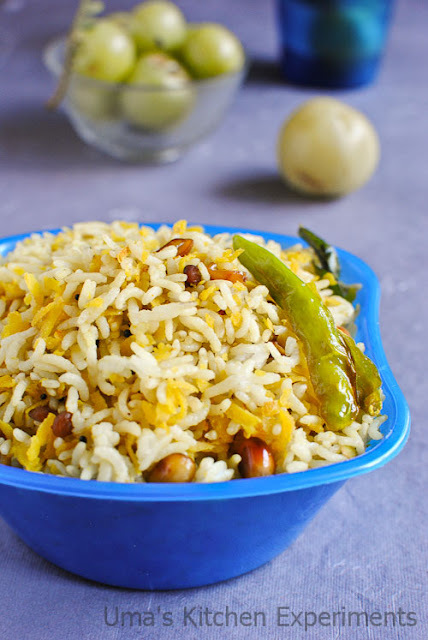 This rice recipe is very easy to prepare. It tastes similar to lemon rice and you'll get a slightly sweet taste after eating it. 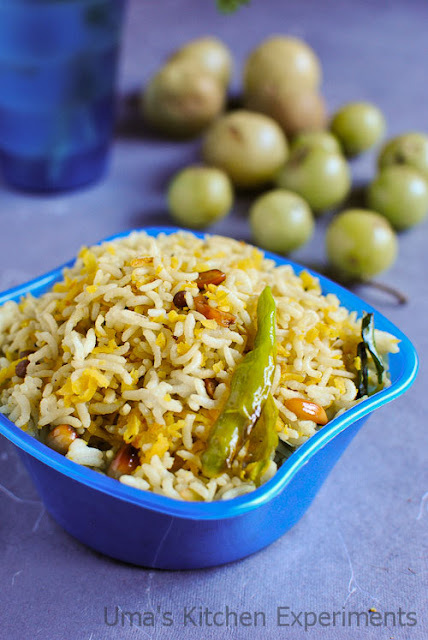 Those who like Amla/Gooseberry will definitely like this rice too. 1) Heat oil in a frying pan / kadai. When it is hot, add mustard seeds and allow it to splutter. 2) Add curry leaves, channa dal, roasted peanuts, asafoetida, slit green chillies. Fry till the channa dal becomes golden brown colour. 3) Add the grated amla followed by salt and turmeric. Mix well and cook the Amla. Note that it is not required to completely cook the Amla. 4) Give a very good toss. When the raw smell of turmeric goes away, add the cooked rice and gently mix it. Lower the flame to avoid burning. 5) Garnish with coriander leaves and serve hot. 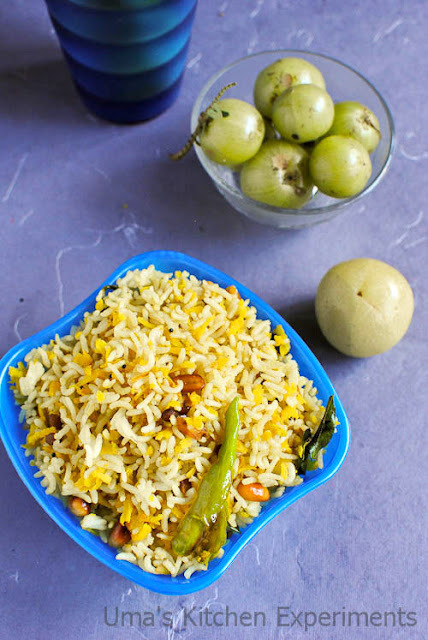 1) Leftover rice can also be used for this recipe. If you are using hot rice, fluff the rice using fork and mix gingerly oil with the rice. Allow it to cool to room temperature before you mix it with Amla. 2) If Amla is not very sour, then increase the grated Amla to 3/4 cup for 3 cups of rice. 3) Add 1/8th teaspoon of fenugreek seeds /powder if you like it. 4) Increase or decrease the red chilli/green chilli count as per your taste. Simply wonderful and healthy rice.Loved the look of it. Me too prepared this rice,love the tangy n healthy rice!! simply wow! such a refreshing and healthy dish. now that you have posted it am really really craving for it. love cut amla with salt and pepper. 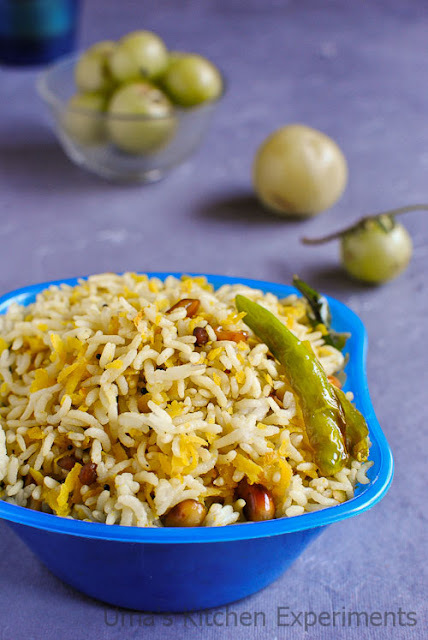 Refreshing taste here...Loved the way the rice is made..looks yum..
Real healthy and innovative rice..
Amla is so rich in vitamin c - its so healthy to eat one a day !! Unfortunately we don't get any fresh amala thus side if the world !! I love the pickle too, but never had amla rice sounds interesting ! Glad, if you stop by mine too.